Do you need a tool that can quickly analyze or check the availability of really large domain lists? Not even really large lists, any size list!? If you answered yes to this question then look no further, your solution is here! 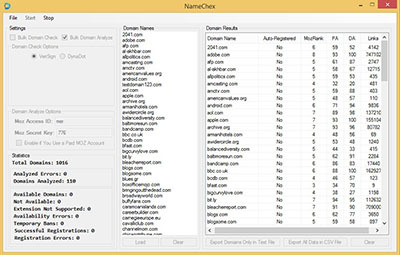 NameChex is a unique Windows application that helps you quickly find and/or analyze domain lists of any size. Take a minute and check out some of the major features below.. Bulk Domain Availability Checker - NameChex offers two different methods for checking domain availability in bulk. First, you can simply enter in your DynaDot API key (obtainable for free) and have the software check availability on up to 100 domains at a time! The second option requires no API details and checks domain availability directly with Verisign! The second option currently only checks one domain at a time. Automatically Register Domains - Those using the DynaDot API option to check domain availability can choose to have available domains automatically registered and put directly into their DynaDot account! Keep in mind, this feature does require that you have funds deposited into your DynaDot account. Bulk Domain SEO Analyzer - NameChex has the ability to automatically pull MozRank, Page Authority, Domain Authority, and Backlink Counts against any size domain list by utilizing the Moz API. This feature checks 10 domains per request for Free Moz Accounts and 50 domains per request for Paid Moz Accounts. Real Time Statistics - View realtime statistics on successfully analyzed domains, available domains, not available domains, and much more! Keeping an eye on the stats will keep you informed on how much time the software has left to run. Free Lifetime Updates - By purchasing a copy of NameChex you'll receive free lifetime updates. Each time you open the software it will look for a new update and prompt you automatically when one is available. This tool is a must for players in the SEO industry looking to build private blog networks or pick up available domain names which are getting links from high authority websites! Purchase your copy today and forget the process of manually visiting websites to look up different SEO metrics like MozRank, Page Authority, Backlink Count, and Domain Authority. Forget the long process of loading domains into a website 100 at a time and repeating the process over and over again until you've checked them all. Instead, open your copy of NameChex, add your domains, and press the Start button! Pricing: Download Now - The software costs $49.99USD. However, forum members can receive a 10% discount by using the coupon code 'FORUMS' during checkout! Refund Policy: There is a 7-Day money back guarantee on this application. Purchase it, download it, and try it out for a week to see what you think. If it doesn't live up to your expectations then let us know within the first seven days and we'll issue a full refund! Lots of new updates. Check out website to learn more! This software is saving tons of people time and money. Get your licensed copy today!